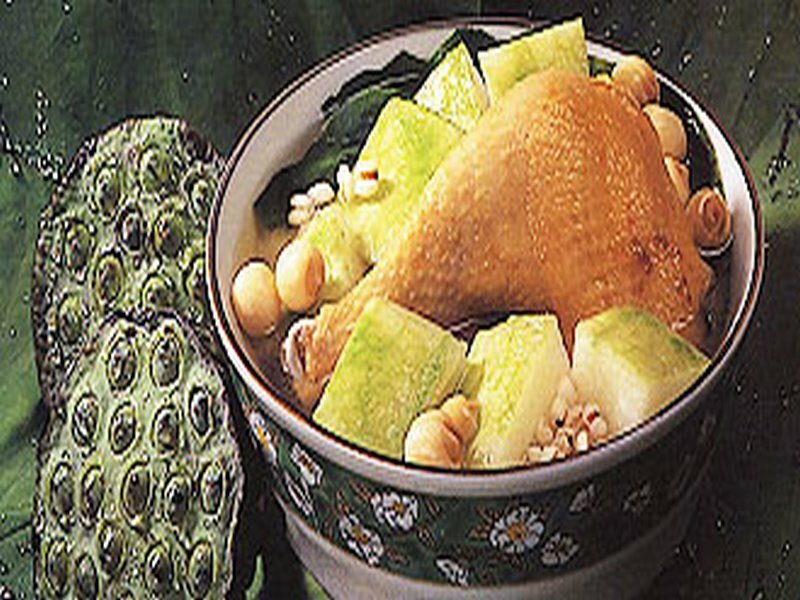 "Winter Melon with Chicken and Lotus Leaf Soup"
Rinse and blanch lotus leaf in boiling water for 1/2 minute, remove. Blanch chicken and lean pork in boiling water for 2-3 minutes, remove and rinse. Peel and cut winter melon into large pieces, rinse lotus seeds and pearl barley. Bring 12 cups of water to the boil, lower chicken, lean pork, ginger, lotus leaf and pearl barley and boil over a medium low heat for 1 hour. Add winter melon and lotus seeds, continue to boil for 30-40 minutes until tender. Season with salt to taste.